The first Latina to serve as U.S. treasurer and founder of both a bank and Mexican food company has died. Romana Acosta Bañuelos died Jan. 15 of pneumonia with her family at her side. She was 92. Acosta Bañuelos’ biography is a classic rags-to-riches tale. The daughter of poor Mexican immigrants, she was born in a small mining town in Arizona on March 20, 1925. During the Great Depression of the 1930’s, as the country forced the repatriation of some 400,000 Mexicans and Mexican Americans to Mexico, the family was persuaded to voluntarily relocate back to Mexico, daughter Mona Bañuelos told EGP in a 2009 profile of her mother in conjunction with a celebration of her life at the bank she had founded 45 years earlier. Acosta Bañuelos married when she was 15 and by age 18 had two sons, Carlos and Martin. By 1943 she was divorced, living in Juarez, Mexico and crossing the border daily to her job in El Paso, Texas. Hearing about better paying jobs, Mona said her mother moved to Los Angeles where she worked long hours as a dishwasher before landing a job as a waitress, which is where she learned about the restaurant and food industry. At age 21, she married Alejandro Bañuelos, soon thereafter taking $500 in savings to invest in A tortilla factory. She would later buy out her partners, growing the business to become Ramona’s Mexican Food Products, Inc., a multi-million dollar family-owned business known for its frozen burritos among other items. 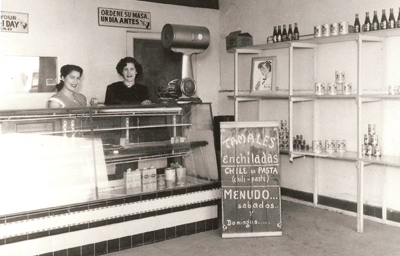 Her success in the Mexican food products business would lead her to a pioneering role in the banking business. A group of businessmen approached her husband to help them start a bank in East Los Angeles, but he suggested that they’d be better served recruiting his wife instead. Acosta Bañuelos believed that if Latinos could increase their financial base they would have more political influence and improve their standard of living. Bankrolling Latinos starting their own business was one way to achieve that goal, according to her profile on the U.S. Department of State website. In 1964, Pan American Bank opened in East L.A. In 1969 she was elected chair of the bank’s board of directors, and would later serve three terms as bank president while simultaneously serving as president of Ramona’s. In 1970, President Richard Nixon was looking to appoint a Mexican American to his Cabinet and White House staff and political insiders encouraged Acosta Bañuelos to submit her name for consideration for U.S. Treasurer. Her nomination was protested by Chicano and labor activists, angry that an immigration raid on her factory found her to be hiring undocumented workers in violation of immigration law and her union contract. Labor leader Cesar Chavez testified against her at Senate confirmation hearings, but she was ultimately confirmed as the 34th U.S. Treasurer, a position she assumed on Dec. 17, 1971, thus becoming the first Latino/a to serve in the position. She resigned three years later. The attention-to-detail Acosta Bañuelos brought to her business life often found its way back home Mona said in the profile, adding that her mother would micromanage the kitchen during Thanksgiving dinner preparations. This hands-on approach, she said, was evident in her mother’s unusual approach to finances. “For a long time I never understood why she never invested in the stock market,” Mona said. “Why would I ever invest in something I am not a part of or control,” is the response Acosta Bañuelos gave her daughter, who said her mother claimed she didn’t like to take to risks. Acosta Bañuelos is survived by her daughter, son and 12 grandchildren.